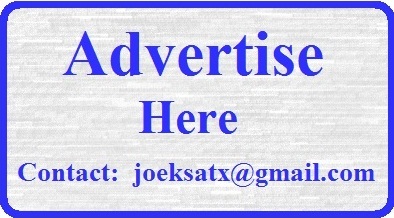 Submitted by JoeKeresztury on Fri, 04/18/2014 - 01:54. 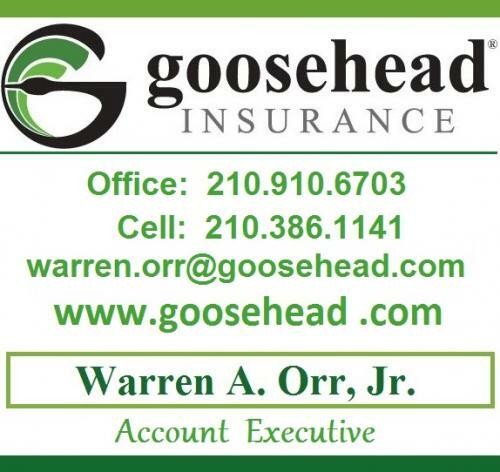 Is yours functioning properly in your San Antonio area Home? Probably not ! ! ! In over 90 % of homes that I have inspected in recent years that have garage door openers, they are not properly functioning for auto reversal due to not being set as needed at the unit during installation! Why? Because no one monitors this safety issue. Unfortunately in many cases the Garage Door Opener (GDO) when installed on a home is not checked by the installer after the installation for proper functioning of the reverse mechanism on the unit. The auto reverse mechanism is different then the motion sensors (eye sensors) that are located close to the floor on each side of the garage door(s). It is an additional safety component in addition to the motion sensors. 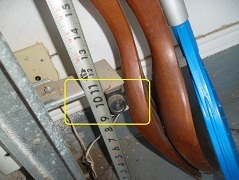 On a New Home the GDO installer and the builder and city inspector are not monitoring this important safety issue. 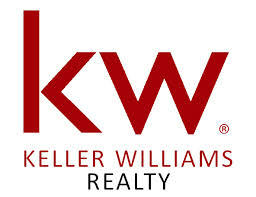 How do I know this, because I do many New Home Pre Move In and Builders Warranty Inspections. And the Auto Reverse system almost always is not properly set at the unit. This is a real safety hazard. 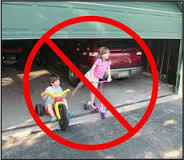 Injuries from Garage Doors account for around 20,000 Emergency Room visits every year and many children have been killed since the early 1980’s from garage doors that did not auto-reverse when met with contact. 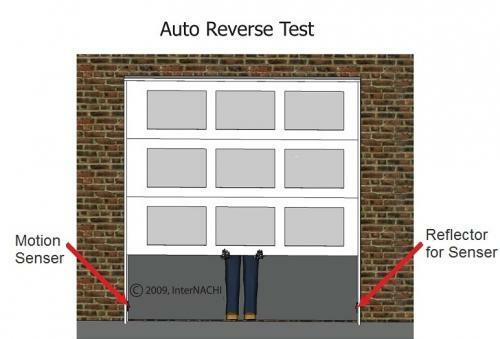 Garage doors have been required for years to come equipped with the Auto Reverse Mechanism that will reverse when it comes into contact with an object. In a lot of cases many newer openers are not adjusted properly and won’t auto-reverse due to improper installation and the lack of simple adjustments that are needed at the time of installation. 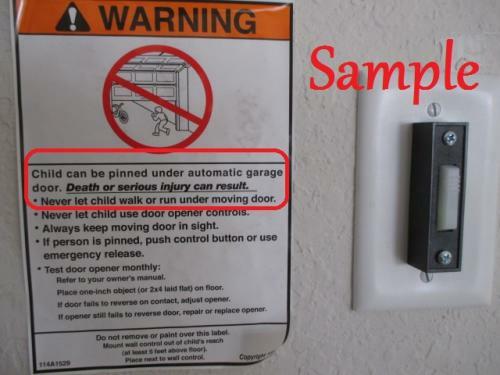 According to the U.S. Consumer Product Safety Commission: Approximately 60 children have been trapped and killed under automatic garage doors since1982. This averages numerous deaths per year. 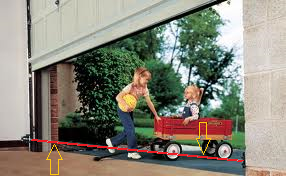 In addition, many serious injuries have occurred, Children have suffered brain damage or other injuries when the closing garage door came down on them and failed to stop and reverse its direction. The auto-reverse mechanism is very basic. When the door comes down on an object, it should reverse. So as you can probably tell, the garage door reversing mechanism is extremely important. It is the component that allows the door to quickly reverse if it encounters an obstacle, like a broom stick, but much more importantly, like a child, an elderly person or a pet. The weight and pressure involved in closing a garage door can cause serious injury to someone in the path of the door. 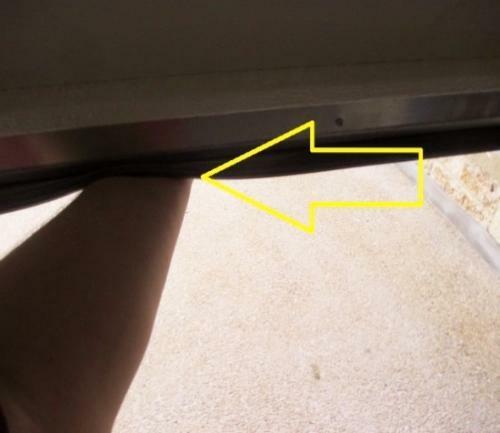 The photo shows a San Antonio area garage door at a recent new home inspection with the garage door opener not reversing with excessive resistance. Adjustment at the unit is needed due to not being properly set at installation. The Motion Sensors (Sensor Eyes) for the Garage Door Opener are NOT the Auto-Reverse Mechanism but is also an important safety component. These are the two little eyes, sensors at each side of the door that should be 4-6 inches off the floor. When the beam between the sensors (red line in photo) is interrupted, the door should stop. The photo shows the motion sensor at this San Antonio home higher than the recommended height for safety purposes. Should be lowered to between 4-6" of the foundation surface. Even if your motion sensors are properly functioning it does not mean your auto reverse mechanism should not also be functioning as intended. They are both required safety components per modern standards. Correcting an inoperable reversing mechanism varies greatly depending on the model and age of the door opener. It may be as simple as adjustment with a screwdriver, or it may be serious enough to require replacement of the garage door opener. The owner’s manual for the garage door opener will provide information about adjusting the reversing mechanisms. If the correction of the reversing mechanism is more complicated than a simple adjustment, contact a competent garage door service company. In conclusion, it defeats the purpose of posting the warning label shown by the garage door opener button if the safety features are not properly functioning for the system as needed. 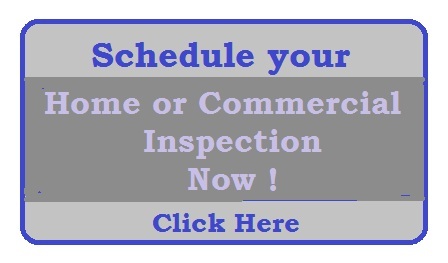 On many new home pre move in and warranty inspections the clients are surprised to see the auto reverse not functioning when tested with resistance, especially on warranty inspections when the homeowners have been in their home for a year. The auto reverse mechanism and motion sensors are basically backups for each other for safety purposes. 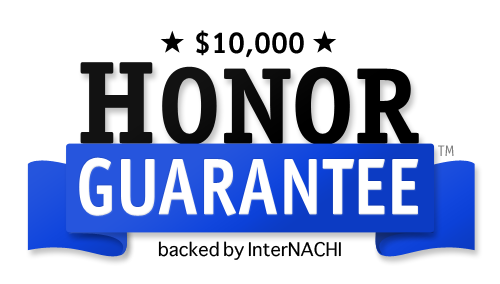 For best safety results both should be tested occasionally to check for proper functioning.